Last week I accepted an invitation to attend the Sony UCHI media event week in a conceptual “house” they’d built inside an industrial warehouse in Sydney to showcase their latest & greatest new home entertainment & technology products. UCHI is the Japanese word for home or inside and the idea was to demonstrate how a home with all Sony’s new products would be fashionable and the devices would all be able to communicate each other using the DLNA (Digital Living Network Alliance) standard which enables digital content such as photos, music, and videos to be shared between consumer electronics like TV’s, personal computers & mobile devices. In essence the TV is so thin because the HD video & audio signals displayed on it are transmitted via “BRAVIA 1080” Wireless technology to the ZX1 in real time by a RF (Radio Frequency) remote command unit containing an MPEG4 AVC HD tuner & 4 HDMI inputs (1 x display; 3 x media receiver) which can be stored anywhere in the same room as the ZX1. A design masterpiece created to enhance the stylish living space, the BRAVIA ZX1 is guaranteed to catch and hold attention. The extraordinarily slim 9.9mm HD display – as thin as a CD case – is a world first for an LCD TV, making it an instant technology must-have for the design conscious consumer. This remarkable advance in engineering was achieved by using side-mounted LEDs to illuminate the screen, instead of the usual backlight array. 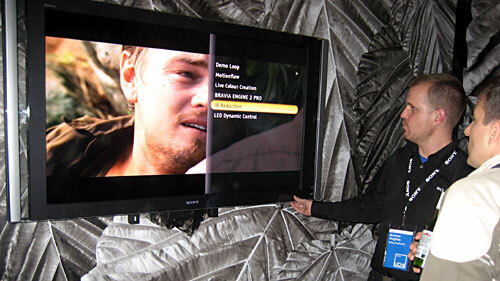 Edge LED technology is the secret behind the world’s thinnest LCD TV. The BRAVIA ZX1 has an estimated release date of March-May 2009, the price has not been determined yet Read the BRAVIA ZX1 press release with technical details and specifications. The result is not only unprecedented image detail, but also a wide dynamic range that enables subtle colour and tonal gradation to be captured just as the human eye sees them. For a change that’s not just marketing spiel, I took several photos in darker areas of the UCHI warehouse and also in areas partly in shadow/spotlight with impressive results – very low noise and good dynamic range showing details in the shadows even with relatively high ISO eg: 2000/3200. One of the Sony spokespeople said they hoped the Alpha 900 would attract the interest of serious photographers (weddings, events etc) who currently use Canon DSLR cameras. The Alpha 900 Body only should be released in Mid-October 2008 for estimated AUS$4,499 RRP inc GST. Read the Alpha 900 press release with technical details and specifications. I’m a big fan of noise-cancelling headphones because they allow me to listen to music in relative peace and quiet without having to turn up the volume really loud while commuting on trains and buses. Sony makes the bold claim that their new NC500D headphones ensure optimum audio quality while improving noise cancellation performance by going digital – thereby reducing up to 99.1% of ambient noise at 160Hz (the peak frequency of a jet engine). In a new twist for noise cancelling headphones a processor inside the NC500D automatically adapts the cancellation profile to suit the characteristics of ambient noise. In normal use, when the ‘Select’ button is pressed, the headphones will automatically select from three cancellation modes to suit the surroundings – whether on an aircraft, a bus or train, or in the office. Alternatively, pressing down and holding the mode switch allows the user to manually select the cancellation profile that is most effective in their environment. Ironically there was just too much noise, talking and music in the UCHI warehouse to verify these claims when I tried to listen to some music using the NC500D headphones. To see whether the NC500D headphones really work I’d have to actually try them out in different scenarios (office work, travelling on the train & walking through crowded city streets) to see if the claims of a substantial improvement over other noise cancelling headphones is justified. UPDATE: Just wrote a review of the Sony MDR-NC500D Digital Noise Cancelling Headphones as Sony lent me a pair to test during the last few weeks. Wow!! Now those noise cancelling headphones could be awesome for us, I work as a dentist myself and can see the benefits to patients who often comment that they hate the sound of the drill. Also, through our dental academy, we train dentists in new techniques and cover marketing and patient care in some detail – this could be such a fantastic tool in building your business as a dentist – will get my grubby mitts on a set of these to test out then see if we can get others to buy. Brilliant product.